Three evil powers have joined forces to deceive you, rob you and imprison you in religious structures. It's time to fight back. For years a controlling Jezebel spirit has seduced the unsuspecting, even in the Church. Now the destructive forces of her daughter, Athaliah and Delilah are becoming evident as well. 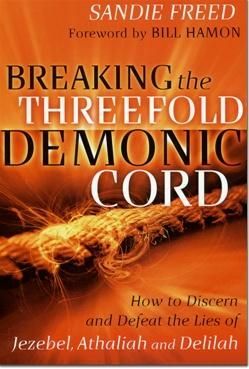 The joining together of this "threefold cord" is the enemy's secret weapon - and it is gaining alarming momentum against believers. This is no time for fear; it is time for action. God wants to provide His people with wisdom and anointing to expose and defeat these destructive spirits. An outpouring of godly expansion and growth awaits all who seek His direction. Discover how to break free of the confinement of old generational cycles and gain a stronger foothold in your stand against evil. Learn to discern and defeat the plans of the enemy against you. Join the battle and claim your righteous destiny through greater revelation and divine prayer strategy. Sandie has a passion to minister deliverance and life transformation to God's people. She releases a powerful anointing of healing and hope to those who have been held captive. With a strong anointing of discerning of spirits, Sandie has been known to discern territorial strongholds and release churches and regions from spiritual assignments that withhold finances, deliverances, and breakthroughs. She is also known for her "cutting-edge" prophetic ministry in which she not only hears from the Lord through a powerful prophetic anointing, but also moves very strongly in word of knowledge and miracles. Pastor Michel White-Haynes is the Founder and Pastor of the Greater Faith Temple Church of the Living God in the Bronx, N.Y. She carries an Apostolic mantle upon her life and has been called by God to be a covering for a number of ministries. She is the Overseer of Greater Faith Temple Ministry Alliance, [GFTMA] covering Greater Faith Ministries [Harrisburg, PA], Bountiful Blessings [Hempstead, NY], Greater Blessed Hope [Mt. Vernon, NY], GFT Living Word Ministries [Monticello, NY] GFT Rhema Christian Worship Center [Newburgh, NY] and Revelation Universal Worship Center [Summerville, SC]. Also part of GFTMA is Redeeming Hearts Ministry [Bronx, NY]. We believe that this is Pastor Haynes’ season and we look forward to this alliance [GFTMA] expanding to include other churches and ministries in the very near future.